The Necromancer may have been cast out of Dol Guldur, but a lingering darkness remains over Mirkwood, a shadow that will grow ever longer as the years draw on - unless a fellowship of heroes step forward and hold back the gloom. 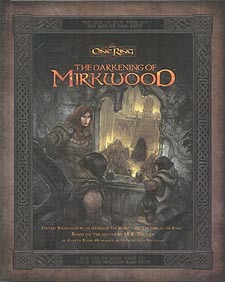 The Darkening of Mirkwood is a complete campaign for The One Reign, set in Mirkwood over the course of three decades. It allows you to tell your own epic saga, following your heroes in their quest as the tale of years unfolds before them. This supplement includes enough adventure material to keep you playing for months or even years, as well as new rules that give your heroes a real stake in what happens to the world around them. Rules for Holdings allow them to carve out their own corner if Middle-earth whilst new Undertakings to complete in the Fellowship Phase allow them to chart their own path. Visit the parliament of Spiders, do battle with the Nazgul, meddle in the affairs of Wizards and enter the Halls of King Thranduil. Stand firm against the Shadow and maybe the Darkening of Mirkwood can be averted. Falter for even a moment and all that you know and love will be lost.